That moment when you hit a rocky moment in a friendship; that event, action or inaction which impacts on you with such vigour that it forces you to review whether the friendship should remain. We can learn a lot from examining our own behaviour at times of friendship crisis – how we handle critical moments. Friendship-cynical or not, it can change the pattern of what we get from future people experiences. How do you mostly deal with a critical stop in a friendship? Which one of the following Friendship Behaviour Types mostly resembles what you veer towards (knowingly or unknowingly)? You call or pull up to their house, the pub, the club & ‘have it out’ in full, aggressively calling out point for point, having a full on verbal (& possibly physical) fight, avenged by the original issue. Often snowballs to include any other past grievances or counter-arguments being offered. Argue until one of you is tired – not until a compromise is reached. Get your own back with destructive vengeance. Wait until an unsuspecting moment to humiliate or undermine your friend by revealing or doing something destructive that will deeply hurt or embarrass them, showing no remorse. Justify it by telling yourself they needed bringing down a peg or two. Likely to prime a counter attack. But you don’t care – its on! 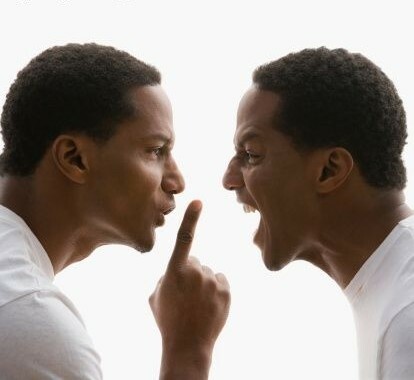 It’s about having the last word – otherwise known as verbal-jousting – or as we Caribbeans call it, “t’rowing word”. You want to hold a post-mortem about it and argue a technical case to clear things up. This includes saying inflammatory follow-on statements to intensify infuriation within your friend – even if you can’t win the original argument, you win by order of stunting their comfortability. Your approach is akin to the arguing style of a 13-year old annoying the heck out of their sibling. You think inwardly, speaking little of the incident – you withdraw from contact with your friend and spend time reviewing the issues & consequences in your mind. You intermittently re-open the can of worms to analyse, sparking ‘grey-cloud moments’ & many sub-questions. Each incident creates another barrier between you and your friend as you never directly deal with the issues yet you change your behaviour to protect yourself from re-occurrence with each incident. You’re the balanced thinker and skilful, wise communicator. You think inwardly, speak from the heart, ask for change in a relationship when you need it and you mostly stick with a friendship through tough times, although you communicate that the ‘hanging in there’ rope is not extensive – you’re principled in the things that you will invest as well as what you won’t accept and aren’t afraid to quietly move on if you feel it’s no longer a comfortable ‘win-win’ connection. You listen and take on board what your friend has to say – you’re fair but you’re no push-over. Moving on just means contacting the friend less. You don’t do dramatic exits. If you’re asked directly about why you’ve gone a different though, you’ll speak your mind – in a balanced way of course. You list (to yourself, your friend, your other friends, your social networks – anyone who will listen!) all the things the other person does, with full comprehension – never including any objectivity about the responsibility you have with the situation or how you can help move it forward, wrong or right. You will be the one to tell your friend about his/herself. Cos that’s just how you are. And you ain’t changing for anybody! OK. Right. You beat yourself up, citing your own sensitive personal circumstances or issues to be the contributory factors that influence your friend’s decisions and actions. To you this is 100% the case although it is never confirmed – you just know. Because you’re physic. Or something. That’s what you base your argument on – what you know your friend thought. You feel you’re the underdog in the situation because of your insecurities & that is what fuels your stance for holding out against your friend. You may or may not tell them about your philosophy but you’ll treat them with disdain. Even if you make up you’ll convince yourself that they look down on you because of it. You shut your friend out. Can’t deal with it or them right now – it’s just not your priority. You ignore calls, texts, social networking messages and consider yourself to be ‘taking time out’. Far be it for anyone to accuse you of being passive-aggressive. You just don’t have the time to take it on board. Whatever. You recite all the wonderful things you do in the relationship that that your friend should be grateful of, telling yourself your friend and others that your friend should be happy to have a friend like you. You don’t let anyone put you down and believe that people would basically be better off for having someone like you around – you give so much! You watch what others give and feel that they never match what you do, so you feel short-changed. You constantly remind yourself and others about what you bring to the table and you fundamentally believe it’s not acknowledged enough. You believe wholeheartedly in adult communication, in putting things right. You feel really ‘sorted’ by tackling the situation in a direct, adult way. Soon enough your friends realise that as long as they talk or make promises to change, they can still continue the friendship, as you never show them consequence – apart from more talking! In your previous life you were a Film Director. You feel no remorse about cutting the person out of your life – your tolerance for drama, fights, making up, trust or being let-down is low. Instead if a friend avenges you, you don’t hesitate to write off the friendship – vocally or by stealth. You don’t do forgiveness or headache and your way is low. iSeeYou swallow hard at the Friendship Behaviour Types – ha! I have a high propensity towards schoolboy fun & laughter A.K.A. Quah-Quah-JOAKES!!! I have a low tolerance for peer pressure – I be I & you be you. Based on the above values, I am trying to be an Assertive Behaviour Type. It’s where I feel at my best. Everything in life is a ‘work-on’!!! Which one do you *mostly* inhibit? Which one will you *try* to be more like & why? Not only was this insightful and inspiring, but did I see myself as I read through the various Friendship Behaviour Types. I too am guilty of employing some of these behaviours but I have evolved since to adopt more positive behaviour types. I have realised that everything starts and ends with me; I can just be me and let people be themselves, and, when a situation arises, take responsibility for my part in situation, without blame to the other person. Thank you once again for this eye-opener.